The man that likes to express his individual style through his neckwear will love this selection of Elite 100% silk hand made neckties in animal print designs. 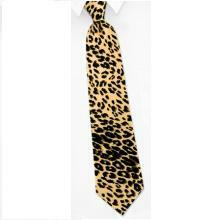 Let him express his wild side in style with this untamed leopard print necktie which is sure to set him apart from the rest of the pack. Pocket Square Sold Separately: We offer a matching 100% silk pocket square that compliments this tie perfectly! The perfect gift for dad!